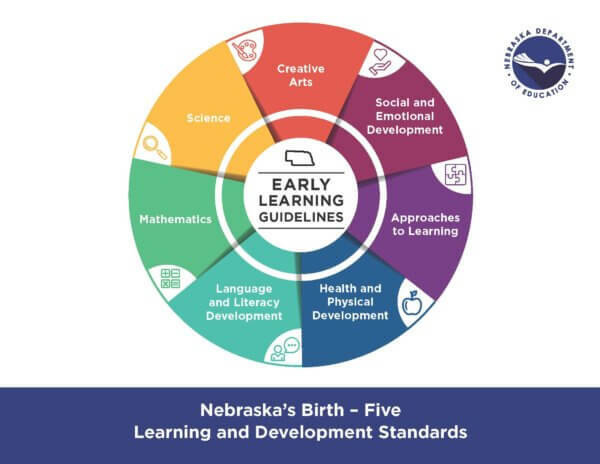 The Early Learning Guidelines Trainings provide information and ideas to child care providers working with children Birth to age 8 in early childhood and after school settings on how to create developmentally appropriate experiences. There are 7 learning domains including Science, Math, Language and Literacy, Health and Physical, Approaches to Learning, Social Emotional Development, and Creative Arts. These trainings meet the state licensing requirement (006.04D 391 NAC 1-3) which required providers to have a minimum of 1 domain complete each year starting in May 2017 until all 7 are complete.